Proper collagen homeostasis is essential for development and aging of any multicellular organism. During aging, two extreme scenarios are commonly occurring: a local excess in collagen deposition, for instance during fibrosis, or a gradual overall reduction of collagen mass. Here, we describe a histological and a colorimetric method to assess collagen levels in mammalian tissues and in the nematode Caenorhabditis elegans. The first method is the polychrome Herovici staining to distinguish between young and mature collagen ratios. The second method is based on hydroxyproline measurements to estimate collagen protein levels. In addition, we show how to decellularize the multicellular organism C. elegans in order to harvest its cuticle, one of the two major extracellular matrices, mainly composed of collagen. 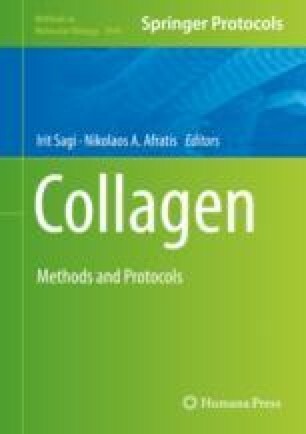 These methods allow assessing collagen deposition during aging either in tissues or in whole organisms. Alina C. Teuscher and Cyril Statzer contributed equally to this chapter. We thank Marjolein Wildwater for sharing her improved freeze-cracking protocol, Eline Jongsma for her assistance in adapting the freeze-cracking protocol, Salome Brütsch and Hayley Hiebert for their help to develop the C. elegans Herovici staining protocol, Anna Bircher for contributing to the early stages of the cuticle isolation protocols and imaging cuticles, Max Hess for providing the C. elegans example image, and Jan M. Gebauer for bioinformatic prediction of potential prolines in collagens that might become hydroxylated in C. elegans. Some C. elegans strains were provided by the CGC, which is funded by NIH Office of Research Infrastructure Programs (P40 OD010440). This work was supported by the Swiss National Science Foundation [PZ00P3 161512] to S.P. and M.R.B. and [PP00P3 163898] to A.C.T., C.S., and C.Y.E. Alina C. Teuscher and Cyril Statzer contributed equally to this work.